Blog to End the Occupation: Petition: No to Technion in NYC! Our member group New Yorkers Against the Cornell-Technion Partnership has started a petition asking the city of New York and Cornell University end their collaboration with The Technion-Israel Institute of Technology, especially in light of Israel's most recent military assault on Gaza. The text of the petition is below. Sign then share it with your friends on Facebook and followers on Twitter using #StopTechnion. We, residents of your District and concerned individuals, are deeply troubled by the proposed plan for Cornell University to partner with The Technion – Israel Institute of Technology to build a campus on Roosevelt Island. We are particularly concerned in light of the recent Israeli assault on Gaza, which began on November 14 and lasted 8 days, killing and maiming hundreds, perhaps thousands of civilians including children, and destroying homes and infrastructure. On November 18, four days into the Israeli assault on Gaza, as civilians were being massacred, Cornell University President David Skorton visited The Technion in Haifa, Israel as “a true friend of the State Israel.” This visit at the height of Israel’s assault shows institutional support by Cornell for Israel’s aggressive attack, and a shameful disregard for Palestinian lives. Skorton’s visit in turn undermines the sincerity of claims he has made that academics should “connect with colleagues in Israel and the Palestinian Territories." 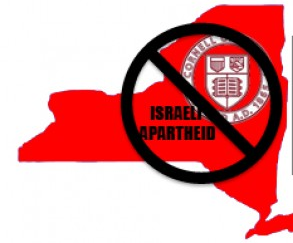 In a clear violation of the First Amendment, a recent peaceful demonstration at Cornell University’s main campus in Ithaca in support of the people of Gaza was aggressively repressed after pro-Israel students contacted the police claiming the gathering violated Cornell’s campus code because it was held without a permit. However, Cornell University’s Campus Code of Conduct clearly states that there is “no need for a mandatory permit” for such outdoor demonstrations. We understand that New York City needs to invest in education and training opportunities; however, this should not come at the expense of others who are not given that chance and who suffer human rights abuses. The Technion is deeply involved in the development of weaponized and surveillance drones and has joint programs with two of Israel’s largest weapons manufacturers: Rafael Advanced Defense Systems, with which Technion graduates developed the Iron Dome missile defense system used in the recent assault on Gaza; and Elbit Systems, which manufactures Hermes drones used to terrorize and kill civilians in Gaza. Technologies developed at The Technion and by Technion graduates at companies like these are used to destroy Palestinian houses, farms, business and government buildings, expropriate their water sources, drive them off their land, suppress demonstrations for their rights, and carry out attacks against people in Gaza, the West Bank, Lebanon, and elsewhere in the region. The Technion is thus directly implicated in war crimes. Detailed information and sources can be found on the NYACT website. You may not know that The Technion practices institutional discrimination against Palestinian students by severely restricting their freedom of speech and assembly and rewarding Jewish students who, unlike the majority of Palestinians, perform compulsory military service in Israel. Not only do these facts contradict New York City and New York State non-discrimination and equal opportunity laws and Cornell University’s own bylaws, they directly contrast the ideals embodied by the recently opened Four Freedoms Park on Roosevelt Island. The park was built to commemorate President Franklin D. Roosevelt’s stated goals of achieving and preserving freedom of speech and expression, freedom of worship, freedom from want, and freedom from fear. When President Roosevelt made that speech in 1941, he said that people “everywhere in the world” ought to enjoy those four freedoms, a sentiment which surely must apply to the Palestinian people, as well as all others. Now that Cornell NYC Tech has entered into the seven-month Uniform Land Use Review Process, there is an urgent need to take a stand. This review process enables an opportunity to express opposition to Cornell’s partnership with The Technion and to stand up for your District community’s interests. We are confident that you will take seriously the important issues raised in this letter.